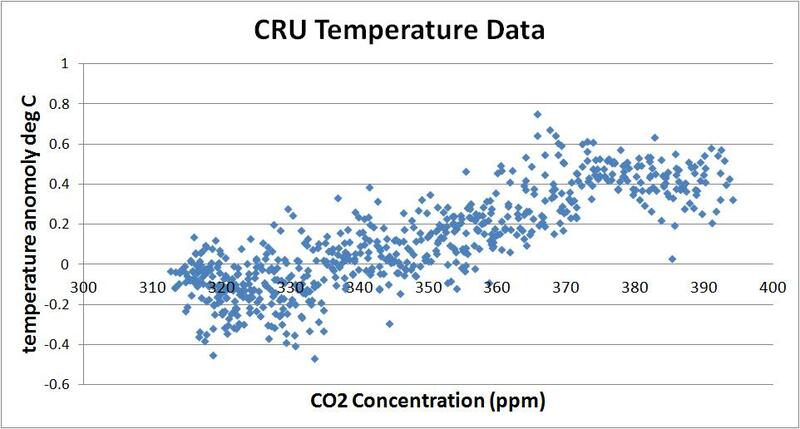 The Anthropogenic Global Warming (AGW) cult is dead wrong about CO2 driving our climate and the graph below reveals their mistake. The top portion of the graph shows the electromagnetic radiation that is both downgoing (from the Sun shown in red) and upgoing (radiated from the Earth to space shown in blue). All objects that have a temperature above absolute zero (0° K) will radiate electromagnetic radiation at various wavelengths and intensity according to Planck’s law and the center of that distribution will be at a wavelength characterized by the Wein’s displacement law. So our Sun, which has a much higher temperature than Earth will radiate energy at a peak frequency of about 0.5 µm and the Earth will radiate its energy at a peak of about 14 µm. 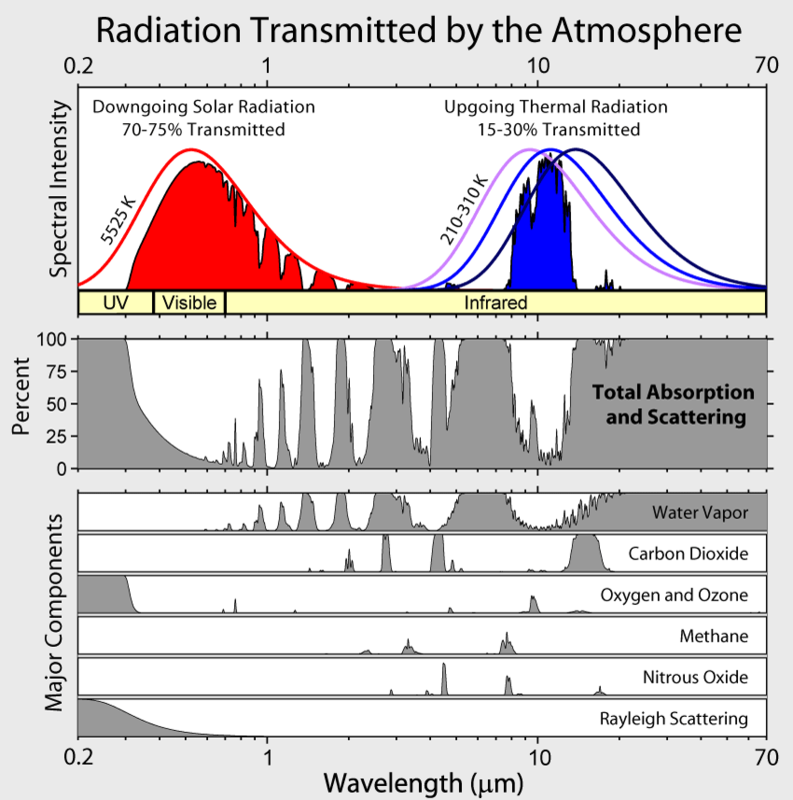 Much of the downgoing and upgoing radiation is absorbed in our atmosphere and the portion of the graph just below the spectral intensity shows where these wavelengths are absorbed. Fortunately for Humans, much of the UV, X-Rays and Gamma Rays of the downgoing radiation are absorbed in our atmosphere (those wavelengths that are small and are not even shown on the left hand of the chart) and for that reason we exist today. Since light in the visible range of the Sun’s spectrum are allowed to pass through the atmosphere, we have eyes that have evolved to absorb these wavelengths. Organisms that had eyes that see only in X-Rays would be ‘blind’ on Earth and would not have had much success catching food. Now here is the portion of the graph that causes so much heartburn with the AGW cult. Looking at the bottom portion of the graph and focusing on the line labeled “Carbon Dioxide”, you can see that the wavelengths of upgoing radiation that CO2 absorbs (which is centered around 14 µm) are positioned of the right hand side of the upgoing radiation curve (which is centered around 11 µm) so CO2 isn’t seeing the higher intensity radiation that gets passed to space. The graph shows that CO2 does a very thorough job of absorbing some of this upgoing radiation (CO2 absorption is pegged at 100% at these wavelengths) and what radiation CO2 doesn’t absorb, Water Vapor takes care of the rest. Adding more CO2 to the atmosphere will not change its absorption spectrum and as this graph shows, there is no more upgoing radiation that it can absorb. In other words, CO2’s radiation absorbing duties are already performing at their maximum level so CO2 is at a saturated state right now with regard to upgoing radiation absorption. And here is another subtle fact that further shoots holes in the AGW meme. If the Earth were to get warmer then the upgoing radiation distribution would shift to the LEFT (per Wein’s displacement law). That would mean the intensity of the upgoing radiation wavelengths that CO2 thoroughly absorbs would be LESS so the greenhouse warming contribution of CO2 for a warmer Earth would be less than a cooler Earth. Conversely if the Earth were to get cooler (i.e. a little ice age) then CO2 would be a stabilizing factor since the upgoing radiation curve would shift RIGHT and there would be more photons for this molecule to absorb and help bring Earth back into a warmer climate. CO2’s contributing factor to the greenhouse effect is saturated and even if the Earth warms, CO2’s role in the greenhouse effect will only diminish. That is a hard pill for the AGW cult to swallow. Secondly, the shift in an object’s spectrum as it becomes warmer is slight for small changes in temperature. From Wien’s Displacement Law, the shift in lambda_max, the peak of the spectrum, is -b*delta(T)/T^2. Plug in the numbers for Earth: T=14 C=287 K, delta(T)=1 C=1 K and you find delta(lambda_max)=-0.04 microns. That’s too small to make the difference you claim. Thirdly, only part of the Earth is getting warmer — the stratosphere is getting *cooler*. This is a prediction of greenhouse theory and an indication it’s working as expected, though the result is complicated by ozone loss. The greenhouse effect occurs at each and every infinitesimally thick layer of the atmosphere, and you have to add up all those contributions, which makes the problem nontrivial. Climate scientists have spent decades getting this right, and these objections were considered long ago. Thanks David for stopping by and taking the time to comment in such detail. See, the problem with the Harries and Griggs papers is they used models to draw their conclusions. The raw data of OLR comparisons showed no decrease over time but the authors had to feed the data into models to cancel out effects of water vapor and temperatures and wouldn’t you know it? There was a decrease in OLR from the model results. on page 189 – “Since the emission increases with temperature, the absorbed energy is much larger than the emitted energy, leading to a net trapping of longwave photons in teh atmosphere.” There should be no reason to alter the raw data through models to prove a decrease in OLR. Let the raw data speak and I don’t see that data proving a decrease in OLR over decades of CO2 getting pumped into the atmosphere. leads me to believe that CO2 is saturated. And when I see flat temperatures even though CO2 is increasing, that tells me the CO2 effect isn’t as large as was once thought. Thanks for linking to your rebuttal. I’m still waiting to hear why OLR didn’t decrease in frequencies that CO2 absorbs when satellite measurements from 1970 were compared with measurements from 1997. Not only did OLR not change but the absorption bands didn’t expand. The AGW theory states the OLR should have been reduced and the wavelength bands should have expanded. They didn’t. The saturation fallacy has been written about for years. Please read some of the rebuttals before repeating the same old mistakes. Please read my comments above and explain why satellite measurements refute the AGW theory. There is much written on this subject; see the sidebar “Saturation fallacies” in Raymond T. Pierrehumbert’s “Infrared Radiation and Planetary Temperature,” Physics Today, Jan 2011 pp 33-38. In reply to Sthelensoregon at http://www.nature.com/nature/journal/v410/n6826/abs/410355a0.html – You notice the authors make those claims using the data that have been modified (or simulated) from Climate models. You can see there is no difference in OLR in figure (a) on this link – http://www.nature.com/nature/journal/v410/n6826/fig_tab/410355a0_F1.html#figure-title but magically things change once the data has been run through the all knowing climate models. Figure 1a clearly shows a difference in OLR between 1970 (gray line) and 1996 (black line). The top graph in Figure 1b is a plot of that difference. Well? How would *you* account for differences in atmospheric temperature, water vapor, and ozone levels?? As I stated in a comment above, according to Ramanathan, we don’t need to correct for temperature. If the temperatures were higher, then CO2 would be allowed to grab even more longwave photons. CO2 has increased as well from 1970 to 1997 so we have more CO2 to capture more photons so even if the temperatures were higher in 1997 that CO2 blanket should capture them. Was Ramanathan wrong? Have you examined how absorption and emission varies with temperature and pressure? This has been discussed at least since the work of Plass. You seem to have no idea of all the science that come before, but believe you can overturn it all with some simplistic notions published in a biased, nonscientific magazine. Science has far higher standards than this. Wait, are you saying that Ramanathan (http://www-ramanathan.ucsd.edu/) and the Royal Swedish Academy of Sciences are nonscientific? You have completely misunderstood what Ramanathan says, which is simply a statement about the physics of absorption and emission. Harries et al are correcting for the different temperatures that occurred during the two observation periods, in 1970 and in 1997. This difference exists irregardless of any difference in the greenhouse effect, simply because atmospheric temperature fluctuates naturally. So, again, how would you correct for that (and water vapor, and ozone) without a model? I don’t know Ramanathan and maybe you have better insight into this but I do understand English and my interpretation of his words still stands. But let’s assume you are right…. Why do we have to ‘correct’ for water vapor? With increased amounts of CO2 and the dire predictions coming from the AGW team, you’d think CO2 wouldn’t be so easily muted by water vapor. Water vapor is in the atmosphere and although we can do our best to remove the effects of it by models, we can’t do it in the Earth’s atmosphere. If OLR didn’t decrease in wavelengths that CO2 absorbs then the conclusion a scientist should come to is maybe we overestimated the additional heat trapping that will come from added CO2 in the atmosphere. From 1970 to 1997 the raw data showed no decrease in OLR in the wavelengths that CO2 absorbs (granted they didn’t cover the entire spectrum here which is unfortunate) but yet the Earth warmed during this time (based on CRU and UAH data). If no more OLR was trapped, then what caused the warming? Mother nature isn’t concerned with models and she’ll follow the laws of physics no matter what. The whole premise of AGW is that the absorption of OLR by CO2 will cause heating in the atmosphere and the smoking gun of this warming is a decrease in OLR at those wavelengths. That didn’t happen in the raw data, only after we magically removed water vapor. As for temperature correction…. From Stephan-Boltzmann law, the Watts/m^2 will increase by the 4th power of temperature so as temperatures go up, the overall radiation increases. Planck’s law can be used to find out the intensities at a particular frequency. So, that is how I would correct for temperature and I assume that is how the models do it. But CO2 concentrations in the atmosphere increased from 315 ppm to 365 ppm from 1970 to 1997 which is almost 16%. Temperature anomalies increased by only 0.2 C during that time and if we say the average is around 14.0C then we are talking about an increase of around 1%. Surely the massive absorption increases from CO2 should’ve counteracted the modest temperature increases. Right? Unless CO2 is saturated…. Why must one correct for water vapor? Because water vapor is a major greenhouse gas, and its atmospheric level has increased by about 4% in the last 30 years (due to global warming itself — warmer air holds more moisture). So this change affects OLR, and must be accounted for it you want to detect decadal differences in OLR. Understand? Thanks for making my point for me David! Water vapor is much more important to atmospheric absorption of OLR than the saturated CO2. Everyone knows water vapor is a greenhouse gas. They also know it is a feedback, not a forcing. Stick to writing for the american ‘thinker’ — no one else would have you, since you’re obviously scientifically inept. David, you quoting stuff that everybody knows. be a real man and use your brain. THINK. be a scientist and just for one second say, what if the opposite were true? what if the claim other scientist have are correct? do the math, do some thinking, and well, if you find no other answer, you can go back and state what you know coz you did the math, did the science behind it. this is not supposed to be a religion, or a cult. from my standpoint, i say CO2 has some effect, but not to the levels described by alarmists. some VERY basic themodynamics can get you to that conclusion. you just proved the point that water vapour has a more significant effect on global warming. water vapour goes up, temperature goes up. have you ever gone to a desert? it gets really hot during the day, but at night the temperature plummets down to freezing. and do you know what’s scarce in the desert? *drum roll*…. water! hence nothing to trap the heat. go to the desert, release some CO2 and tell me if that traps any measurable amounts of heat. Water vapor, globally averaged, only goes up permanently if temperature goes up. It is a feedback, not a forcing. Temperature of what? The surface, the ocean surface, the ocean as a whole, its top half, the troposphere, the stratosphere…? And actually, you will find that the global surface temperature as measured by GISS increased by 0.4 C from 1970 to 1997. Your assumptions about the SB Law are equally misguided — it applies to blackbodies, not atomic absorption and emission. It’s clear by now that your understanding of the science needs a lot of work. So stick to publishing in The American ‘Thinker,’ and leave the Real Thinking to others. Says the guy who has complete faith in climate models to predict the behavior of photons in the troposphere. Clearly you are just as big a tool, and just as much of a liar, as is Watts. once your argument fails, and you realize your can’t back your blind belief, then resort to name calling, it could prevent you from admitting that you are wrong. what astounds me the most out of this entire article is not the content, but the comments. it shocks me to see how close minded and self-righteous people online are. i guess it is a mixture of politics (the other side is always WRONG, no matter what they say), internet (i know it all coz i read it on a website) and just plain ignorance (i don’t think i need an example for this one). i have not yet met one scientist, or spoken with one person who has calculated or seen the calculation that shows that a 0.01% increase in CO2 has any measurable effect on earth. there are plenty of data and websites showing that CO2 is a greenhouse gas, and others that show that the earth is warming up. NONE, the link them together (Scientifically of course), none that link them together other than just making a claim of “duh, what else could it be”. as cosmoscon points out, water has a much bigger influence on the earth’s temperature, and that can be shown by math/science and by effects on the planet. We are not talking about a 0.01% increase, but a 40% increase in atmospheric CO2 levels since the pre-industrial era. Well, Why the AGW crowd keeps messaging data. use charting tricks etc to promote their view. Why does the opposition whom wants to check their results fight tooth and nail to get access to the methods the AGW crowd uses?… In some cases still haven’t gotten access to what data they used. next why did a malariea(sp) appointed by state dept.USA get turned away an told he didn’t submit? OOP’s he sent request by certified mail…Those IPCC guys were caught. let him review the malaria section , oh he had to rewrite what the so called scientist(the two of em, with one paper between them)(IPCC was going to use)…Well, that’s not science and these are the guys running the IPCC are allowing until conored….Hmmm. I can’t see leaglly blind, I make typo’s amd spelling errors which I will not correct…. But let’s say the AGW guys are correct. reducing emmissions of co2 will do what? it will not stop the increase in co2…does it double in 100 years or 150 years, what’s the difference …we would experience the same effect just later by a few decades…common sense I use says reducing emissions is Folly period! fortunately, I am convince the AGW science is very flawed! Re st. data on OLR…didn’t the MIT guy write a paper saying no decrease in OLR? I think so. The IPCC guys et al. can’t fire him or muzzle him…hmmm. I worry about the group that trys to muzzle an different point of view…ever consider that warmer Earth causes more co2 in atmosphere…That’s what historical data suggests….Why did the AGW guys graphs leave out the medieval warm period in their graph? why? why have they left out the warming between 1700 and 1735? why? re: “”Between 1700 and 1735, according to the world’s oldest instrumental temperature dataset, the temperature in central England rose by 2.2 degrees C, equivalent to 6.3 C/century, or about nine times the warming rate seen in the 20th century””” Why has the AGW guys not told us this? I just need to get something cleared out here: What does the tables/graphs for each of the “major components” above show? I.e. the line for CO2: Does it show how much radiation is absorbed if CO2 was the only gas in the atmosphere, or does it show how big percentage of radiation is absorbed by a single molecule of CO2, or what? One thing i do understand: it can not show how much of the radiation going out from earth which gets absorbed by CO2 in total, because it would be impossible for CO2 to absorb 100 % at the same time as watervapour absorbs 50%. Or am I totally asleep here? And my understanding is that these graphs are derived from models and there is a paper here – http://www.cfa.harvard.edu/hitran/Download/HITRAN04paper.pdf 0 that explains it in more detail. And I agree with you, when looking at several elements of our atmosphere that absorb at a particular wavelength (like water vapor and CO2) you can’t have more than 100% absorption! 1. Climate modeling is not about data massaging but about “extrapolating” the data based on scientific knowledge that we know. So making a climate model is nothing more than back-calculation to verify a theory. The climate scientists hypothesize which factors might contribute more significantly than the others then they apply the known physics of such factors into the model. Subsequently, they run the model and compare it with historic data to verify the accuracy of such model. If it does not fit yet, they would add in/opt out factors that were/are considered to be insignificant and then run the model again until it match the historical data. Subsequently, the complete model is then extrapolated to give future data. 2. There is a phenomenon called “peak boardening” just google it. Basically, when a GHG, CO2 for instance, reaches its saturated absorption capability, further addition of CO2 would not pull the peak out of 100% but would boarden the peak to the neighboring wavelengths. As you can see from the right most peak, the phenomenon has already happening at this wavelength for a long time and it would most likely still continue. And for worst, this boardening is eating into the region where Water vapor is least effective in stopping the IR radiation. Look for yourself and see what could that much amount of extra energy being trapped do to the global warming issue. 3. Water vapor is obviously the most significant GHG. However, the rate of precipitation of water vapor is not a limiting factor (the atmospheric resident time is short). The increased release of water vapor into the atmosphere would only result in more precipitation (provided there is enough CCN – another interesting knowledge that you might want to look further into). Therefore, increased emission of water vapor (which is already impossible since 75% of the Earth area is water-air interface, look for yourself how enormous is the amount of vaporization you are expecting from this) would not raise the average water vapor content in the atmosphere. The only factor that potentially affects atmospheric water vapor content is the ocean/air interface temperature. This, however, is a debatable issue because without temperature being increased, the atmospheric water vapor content could not be effectively raised from the current average. So look for yourself, which could have potentially happened before the other? Increase in atmospheric water vapor content or global warming? 4. Unlike atmospheric water vapor content, CO2 precipitation rate is a limiting factor. The major precipitation destination for CO2 was the ocean, whereby CO2 is converted into CO3(2-) and pulled out from the atmosphere. However, the rate of CO2 precipitation decreases as the temperature increases (for water vapor, increase in temperature would only result in more precipitation). Hence, increase in the rate of emission of CO2 would at one point in time increase the temperature to such extend that it inhibit the CO2 precipitation process, causing more CO2 to be remained in the atmosphere, which, in turn, increase the temperature. So is this issue worth a view? Look for yourself. 5. Why is the effect of water vapor must be taken away for their analysis? Good question. Water vapor is having short atmospheric resident time, therefore, it is the most fluctuating factor. There might not be an overall increase in water vapor content but in short term, due to randomness, yes, there is. Hence, to really account for the different caused by CO2 alone, trying to eliminate the annoying randomness caused by water vapor is not an illogical assumption at all. A mass murderer is hiding from the crowd, yes, there is a lot of grade of people in the crowd (some might be mass murderer as well) would you rather imprison the whole crowd or find a way to isolate the required subject? Again, look for yourself. You guys won’t ever change the author’s mind. He’s a true believer and they will stick to what they believe no matter the evidence. He probably believes two of every creature on earth once fit into a four hundred foot long boat. Thanks for the website and stick to your guns on this issue. The AGW crowd has a lot of explaining to do and needs to open up their computer models and data for inspection. One other matter that I suspect is occurring is that the CO2 does not absorb and retain the heat. Rather it absorbs the IR and re-radiates it; scattering the IR in that band of wavelengths. Much like our atmosphere scatters blue light making sunsets appear red. The scattered IR is probably picked up by water vapor which re-radiates the energy in a broad spectrum outside the CO2 absorbing spectrum. In the end, the energy just gets distributed to wavelengths outside the CO2 band and sent out into space. What is the graph for the delta Concentration of CO2/ delta Corresponding Temperature at a constant energy supply? Why can’t this information be found or am I just looking in the wrong places? I think for a complete model of AGW, this would be a necessary and overlooked figure. Analysis of absorbtion should use CO2 particals per unit volume, not per million particles in the air. The reason is you need to account for pressure. The upper atmosphere has much lower pressure and thus if you keep the ppm the same, the parts per unit volume will go down drastically, thus getting to the point where CO2 absorption is not saturated. I hope there are still people following this feed…. I read this article about 3 years ago and at the time struck me as being rather refreshing. Somthing about the whole co2 global warming issues, has always struck me as being more about geopolitics than geology. So I have pondered this issue for some time and concluded that the problem lies in perception. Back in th eighties there was a climate crisis caused by cfcs. The decisive action taken to curtail the problem was popular and therefore, democratic politicians decided that having a problem was a good thing. Now I’m not saying they invented global warming, but as problems go its a pretty good one to be seen to taking decisive action against. Just think of the upside politicaly. One can raise the tax on fuel, close your heavily subsidised and unionised coal mines, you can pay for unpopular renewable energy sources and send the bill to the consumer. And if you are a western predominantly Catholic nation you can ween your nation of the predominantly muslim and orthodox preduced oil. Its a political smorgasbord and one that is being gorged apon. Now if anyone is following this they probably want facts ideas or rational or even irrational scientific aguments. And so here is my theory. Global warming could well be caused by human activity, but which ones? Firstly there is the old cfc problem, we destroyed large amounts of ozone, and though this is old news, I have never heard of global warming being accredited to it. If you consider the atmospheric temperature in isolation then there should be no increase right? Firstly what happens to the energy no longer dispersed by the ozone? It must either end up in the lower atmosphere, creating new ozone and heat or hit the ground. Now as you clever guys know Antartica is a prety big land mass and UV is such aggressive nasty stuf that it can penetrate ice, by about 15cm. And now for the second problem. Given that this energy is not just disappearing, it must be remaining in the ice at a reasonable constant depth? My thinking is that warming ice will eventually make it lose its whiteness and in turn its reflectivity, ergo it will start to absorb other frequencies. Resulting in surface water were the once was none. Stan: nobody has written on this blog for 8 months, what makes you think they care about your opinion when you spout the same story as so many uninformed sources? Try reading the counter arguments, because you write like a brainwashed victim. I’m not saying that you are wrong about climate change, just that you might be. you will see that the last months we are back to normal, from the El Nino effect in 2016. You might also raise the question how the artic can melt when the temperature is about +1 degree for a couple of months but way below freezing the rest of the year. Stan needs to look at Ice Age Temperature.png chart which shows that at the temp.peak of the previous Ice Age, Earth temp was much higher than currently, and at that previous peak, all the Arctic Ocean ice cover was completely melted (What did the Polar Bears do then?) These Ice Age cycles are caused by variations in energy received by Earth from the Sun; by comparison CO2 is minimal importance (perhaps zero). A runaway change is likely. With glaciers at their tipping point, expect a meter increase in sea levels. It is disgusting that the 41 gigatons of carbon we emit into the air, has had an impact on ocean acidification (our natural carbon sink) and the bleaching of Australian coral reefs. This goes without focusing on the message that sea-life is changing migration courses to adapt to access to new food sources. The historical rise in sea levels has already “moved the earth”; albeit a small polar shift – but significant enough to merit measure. As I am not a scientist, do not have a PhD, I lose nothing in terms of credibility to offer not a CO2 reduction (which will require immense political and human cooperation); but a methodology to down convert the IR wavelength that CO2 re-radiates. Call it junk science, if you like. I offer no proof. My only and sincere hope is that it stimulates more conversation amongst those that are in the process of either educating themselves in meteorology, or possess access to real physics laboratories. As for myself, I have ordered some gold colloid suspension, have access to a couple of of light sensitive lens, and IR emitters. Simply to test parametric up conversion of IR wavelengths into less “damaging” blue light. If this befuddle you, try parametric up conversion using uranium glass and ultra-violet light sources, to produce green visible spectra. I am simply vying for the opposite observations. colloidal dispersed gold particles upconvert infrared to non “co2” heat producing warming wavelengths to blue light. create naturally occurring shells of dispersed colloidal gold, surround the planet – planned by barometric differences, and shaped by dispersed laser light. Deposit gold colloid nanoparticles in a uniform electric field. (Not my idea and I lack the appropriate reference). And then plan to reapply after analyzing the impact on glacial melting. perform barometric readings that would correspond to spikes in gold accretion. disturb those areas with diffuse laser light to aggregate spot gold into columnar gold, and it will “rain” gold. diminishing the impact in those more highly accreted areas. I can’t help but opine that less IR would lead to less trapped heat. Best Regards, and I hope this opens more discussion. Be kind, as I seek your input for my education, and acknowledge that your subsequent contributions will shape my meager experiment into something that is more worth of your time, and effort. In the event that I have released information into the “wild” that is actually of value, I give up all rights and copyright, and expect no royalty in return. However, please cite my name, in some way, shape or form. Even a citizen scientist appreciates a good pat on the back. It is a fact that average yearly global surface temperatures have increased by a full degree C. since the late 19th century. Those who claim that the increases in greenhouse gasses primarily CO2 are not the cause have no plausible explanation for the global warming. Some have proposed an increase in solar intensity. That has been debunked. As of now CO2 and other greenhouse gasses is by far the best explanation. There is even a historical link between higher atmospheric CO2 and warm periods in ice core data. Since when was it discovered that CO2 caused El Ninos? Nah. CO2 absorption and retransmitance is non linear in the down direction. Ergo, CO2 is causing about all the temp increase it can cause right now. Hence, CO2 analyzers like the Thermo 410i needs a calibration curve incorporated. Why? Because as the O&M manual states, CO2 IR absorption is non linear. The analyzer wouldn’t read accurately the CO2 % without the curve. Less absorption less retransmittance. Less retransmittance less kinetic temp contribution. Yay me. I have never heard a convincing argument one way or the other on saturation. If there is 1000 tons of CO2 per second being put into the atmosphere( only small part of this stays) then isn’t new CO2 capable of absorbing IR? How does new CO2 get saturated if there is new CO2 every second?